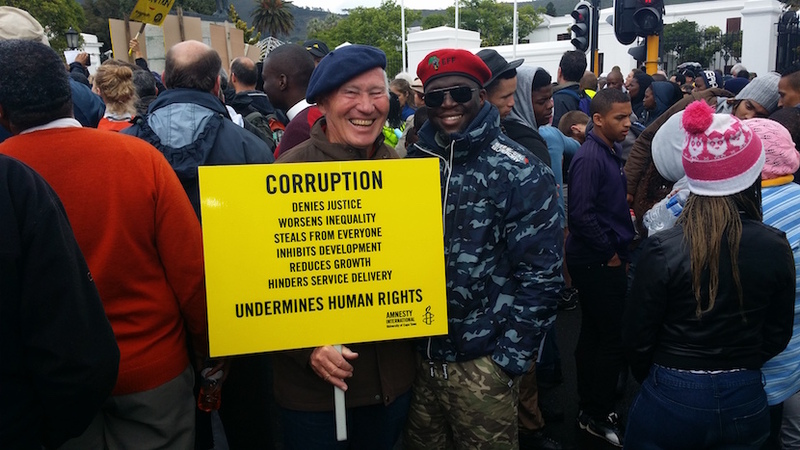 EDINBURGH — Jacob Zuma is a master of state capture and corruption, but he is not the only senior ANC figure who needs to be brought to book for graft. This is according to anti-corruption campaigner Terry Crawford-Browne, who has worked tirelessly at unravelling the details of a multi-billion rand arms deal finalised by the government in 1999. Last year Crawford-Browne lost a Constitutional Court bid to set aside the findings of a commission of inquiry into the deal. The Seriti Commission of Inquiry found no evidence that any of the contracts were tainted by evidence of corruption, fraud or irregularities. Crawford-Browne continues to push for justice, noting that the Swedish prime minister, Stefan Löfven, had a hand in the deal in a previous role. – Jackie Cameron. If the SARB and Ramaphosa are serious about corruption, they need first look at the still-outstanding 20 year Barclays Bank loans signed by Trevor Manuel in 2000 for the BAE/Saab fighter aircraft contracts. Guaranteed by Her Britannic Majesty’s government, the loans are a textbook example of “third world debt entrapment” by European banks and governments. In confirming the authenticity of the loan agreements in the Cape High Court in 2003, Manuel’s own legal counsel, Advocate Michael Kuper SC, described their default clauses as “potentially catastrophic for South Africa.” As we know, the arms deal unleashed the culture of corruption that now afflicts us. BAE and Saab were obligated to deliver US$8.7 billion in offset benefits which predictably never materialised, and were a fraudulent scam perpetrated by BAE/Saab with collusion of the British and Swedish governments and Barclays Bank. US$8.7 billion is approximately R105 billion at present exchange rates, and could make a huge contribution to remedying our financial crisis. Terry Crawford-Browne is the country coordinator for South Africa for World Beyond War. Nelson Mandela initiated discussions with Saab about an industrial school that the company had promised in exchange for union support for the Gripen store...SvD can reveal. But Saab betrayed the promise. The school instead became a co-operation with the defense – and the company paid bribes to union representatives to silence potential critics. According to the defense group’s long-term consultant Erik Larsson it was…Numsa who received money from Saab. “The school was (never built). When the Gripen contract was signed, Saab slammed into what had been said and agreed. The money went to individual representatives of Numsa, says Larsson, who recently appeared in SvD. ” It was me who made sure the money was paid according to Saab’s instructions. – In this context, the amount of millions. – Yes, you can say that. Saab Communications Director Sebastian Carlsson tells SvD that the company “has acted in accordance with the laws and regulations that apply”. – This is a careful review of us, by the commission appointed in South Africa and by law enforcement agencies. Has Saab paid out money to people in Numsa’s leadership in parallel with the industrial oil project? ” I have no reason to go ahead and comment on something further,” says Carlsson to SvD. Nelson Mandela resigned on June 14, 1999 after five years as the country’s president. Four days later, Saab signed an agreement with Numsa with a promise of an industrial school in exchange for Numsa’s support for the Gripen store, as SvD reported earlier. Numsa’s support was a condition for the ANC government to choose the Swedish planet in front of its competitors. The South African Business Magazine Business Report described the deal as a “political coup” by Saab and the British partner BAE. The arms stores never lay on the legendary ANC leader’s table, it was handled by others in the then government. Mandela was nevertheless in agreement with the political importance of the Industrial Policy. In order to gain clarity, Mandela initiated a meeting with Saab, according to documents that SvD has access to. In September 1999, a few months before the Gripen contract was signed, the Secretary of State Zelda la Grange wrote to the Mandela Foundation a letter to the Sanco Citizens’ Movement, politically lied to ANC and also Saab’s partner in the Gripen deal together with Numsa. The meeting was confirmed by the consultant Erik Larsson, in a fax to Saab director Kjell Möller, with a copy to Swedish trade unions who supported the project: Metal, represented by former international secretary Stefan Löfven, and Industrial Services of SIF. “I want to confirm that he (read: Mandela) likes to participate in the discussions about the industrial school”. ” It was at a farewell banquet arranged by Sanco to Mandela’s honor, but at least largely paid by Saab. The reason was to be able to control what was invited, says Erik Larsson . At the table closest to Mandelas, several high-ranking South Africans were placed with influence over the ongoing arms procurement (see Graphics). At the honorary table with Mandela, the highest Sanco leadership and representatives of Saab were among others. – I do not say anything at all. You’ll talk to Saab, “said Saab director Kjell Möller. According to Erik Larsson talked about both the industrial school and the importance of education in general. ” It was an important issue for Mandela. That was the idea of ​​attendance at the table. It was calculated so. I know Mandela was happy with the message he got at the Hyatt, says Erik Larsson . According to the original plans, the Industrial School would be an independent education in its own area in Johannesburg. The aim was to train and train especially black workers to raise the level of competence and also enable better and more fair wages. “Saab would finance parts of the project and put off a million dollars. The idea was also that other Swedish companies with the same interest as Numsa of well-educated workforce would receive money. Just over a year later, when the Gripen contract was signed, the school project took a different turn. Documents that SvD has learned shows how the original plans for buying a property for the Randburg school in Maastricht were abandoned. Instead, Saab announced that it had initiated a collaboration with the already existing Centurion College in Pretoria, adjacent to the Zwartskopf Air Force Base and closely related to the state-owned South African defense group Denel. For Centurion, the purpose, according to an article by PW Butler, director of the magazine South African Soldier, was to “benefit from the agreement with Swedish Saab , together with South Africa’s Defense Forces (SANDF) . – This was contrary to the original focus. Numsa would not be associated with defense cooperation. There was no independent project anymore and nothing lasting. The contract with Centurion was only six years, says Erik Larsson . In March 2001, Numsa finally took his hand from the school project following an internal investigation confirming cooperation with the defense industry. At the same time, Parliament’s investigation was ongoing on bribery. “We can not be linked now or in the future with circumstances that make us compromise on the integrity of the union”. The message was that Numsa pulled out: “This case is now a finished chapter”. ” I tried to explain that there was no future for the planned school unless Numsa was included. But Saab disturbed it and Numsa did not fight or say anything publicly that the agreement was not met, says Erik Larsson . The reason was, according to Larsson, that Saab’s payments were silent critics who could endanger the Gripen deal. ” If you have received money you can not raise objections at a later stage, no matter what happens. Why do not you say which people in Numsa’s leadership are? ” They know that, and that’s what Saab knows. I think it is Saab’s responsibility to report this outward and to shareholders in the company. – What does it matter? It is perfectly reasonable to meet representatives of South African social life and tells you what Saab wants to do. If we had a marketing activity 20 years ago and sponsored a banquet is actually nothing I care about. Has Saab dealt in any way fraudulently against Mandela and Numsa as an organization? – No, on the contrary. We have been sincere with our ambition to contribute to a better education system in South Africa and to do something in common between trade and industry. It fell because we failed to raise enough capital. When it did not succeed, the right many were disappointed. Nelson Mandela initiated a discussion with Saab about the project with an industrial school, in a letter signed by the Secretary of State Zelda la Grange at the Mandela Foundation. Saab’s consultant confirmed the meeting with Nelson Mandela in a fax to his contact person, Saab Director Kjell Möller.